Japanese design studio Nendo recently unveiled the basket-lamp, a lighting fixture made from ‘kana-ami’, the cooking utensils used for traditional Kyoto dishes. Created in collaboration with Kanaami-Tsuji, a Kyoto-based manufacturer of the traditional wire nets, this new line of lamps celebrates Kyoto’s culture and traditional cuisine. Finished with powder paint, the wire netting casts beautiful woven pattern shadows onto the ceiling. Japanese design studio Nendo recently unveiled the basket-lamp, a lighting fixture made from ‘kana-ami’, the cooking utensils used for traditional Kyoto dishes. 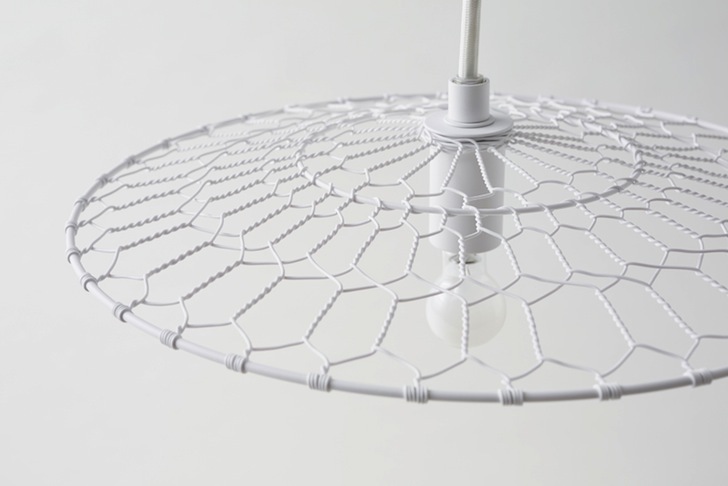 Created in collaboration with Kanaami-Tsuji, a Kyoto-based manufacturer of the traditional wire nets, this new line of lamps celebrates Kyoto's culture and traditional cuisine. Finished with powder paint, the wire netting casts beautiful woven pattern shadows onto the ceiling.